Golf may be less physically intense than other sports, but that doesn’t mean it’s smart to just walk onto the course and start swinging away. There are definitely some things you should do before start your game. No matter what you’re doing, you should always stretch before doing anything physically demanding. Not only is it a great way to prevent an injury, it’ll get you feeling great for the task at hand. For golf, there are a few body parts you should focus on when you’re getting stretched out. Although it’s a short burst of energy, you put out a lot of power with your body on every swing. It’s very easy to injure yourself when swinging hard. Make sure to stretch out your hips, pelvis, neck, and back. There are plenty of exercises you can find on the internet that will detail how to properly and effectively stretch out each area. With all the twisting you do during a round of golf, it’s important to protect yourself before you even step up to the tee. Once you’ve stretched, grab a club and get some practice swings in. 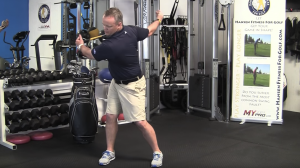 Use the club to stretch out your arms and shoulders in between swings. Once you begin to feel loose, gradually increase the power of your swings. If you start with attempting to drive the ball across the entire course, you probably won’t get the shot you want, or worse, injure yourself. Make sure you have a good support system with you. We’re all busy people, but don’t rush onto the course and don’t let your friends rush either. Help each other out with warming up. If they do rush onto the course, then just take each hole slowly and stretch in between shots. Not only can these preparations prevent injury, they can also improve your game as well. Don’t be afraid to take it slow, and just let your body catch up to your mind.